A big house near Enniscorthy in County Wexford taken from the level of the river. There is mention of "steps" but I cannot see them! Can you? Not the river, the fish pond (25" link). The aerial shot there says it is still standing but ruined and the pond is gone. NIAH entry says it was burned down during the Troubles of 1923. 80 rooms, but no-one home bar 3 servants in 1911. Likewise 1901. [https://www.flickr.com/photos/gnmcauley] Surprising to see no continuity in the names of the servants from one census to the other. The house jumped from 34 rooms to 80 rooms between 1901 and 1911. The DIA says it was renovated in 1908. Impressive greenhouse in the archive! [https://www.flickr.com/photos/beachcomberaustralia] I would think you could count on the fingers of one hand the people who lived in all three of the eighteenth, nineteenth and twentieth centuries. EDIT not true there seems to be over 200 people in the 1901 census who achieved the same. Here is the 3rd Baron himself at the UK's National Portrait Gallery. [https://www.flickr.com/photos/gnmcauley] A tough looking man and a very pretty lady! The 3rd baron died without chidren, as did his brother the 4th, so their 1st cousin became 5th. His grandson, Patrick Thomas Connolly-Carew (7th baron) represented Ireland at the Olympics in the equestian 3-day-event in 1968 and 1972! Form a review of Abandoned Mansions of Ireland in the London Times April 28, 2011. The author Tarquin Blake "camped out in plenty of decaying old mansions"
Almost every house comes with a suitable Irish story. Mighty Castleboro House, in Co Wexford, faced with giant Corinthian columns, was started by its cautious owner only on the day that his heir was born in 1787 securing the succession. When it was burnt out in a chimney fire while the Carews were away, they called in an architect who suffered from gout and had to be ferried round in a wheelbarrow with plans in one hand and a bottle of wine in the other. HUGE DESTRUCTION Great Mansion in Ashes Castleboro', the splendid Irish residence of Lord Carew, six miles to the west of Enniscorthy, was burned to the ground on Monday night. The damage far exceeds £100,000. About 10 o'clock armed men called to the residence of the farm steward, Mr. Richardson, about a quarter of a mile from the mansion, which was unoccupied. They seized barrels of paraffin oil, which was used for machinery and other purposes, and a quantity of hay, and, proceeding to Castleboro', burst in the doors and windows. Hay saturated in paraffin was set alight through the house, and the remainder of the inflammable liquid was sprinkled all over. In a short time the flames, fanned by a high wind, had gutted the whole of the huge structure. Only three of the rooms were furnished, the remainder of the contents having been sold in May 1921. 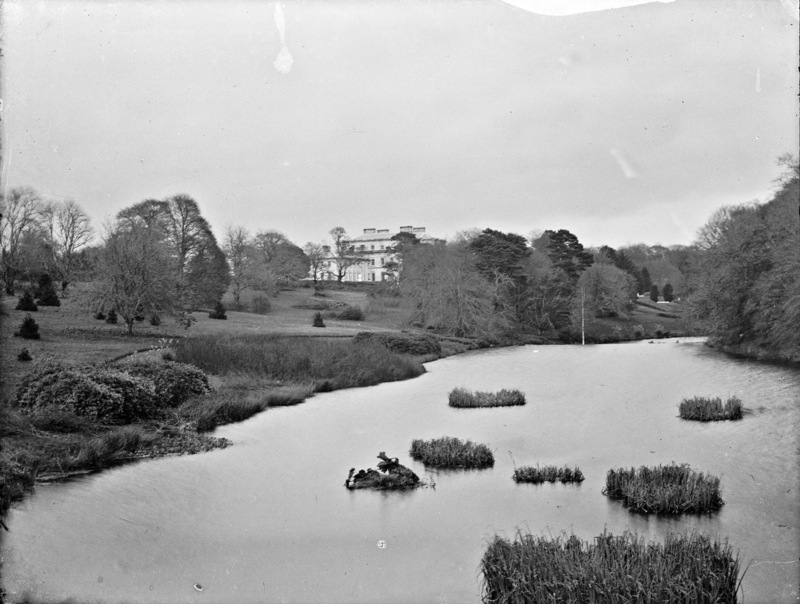 [https://www.flickr.com/photos/johnspooner] On Castleboro architect Daniel Robertson, the DIA says: In spite of his success in attracting commissions, when he was working at Powerscourt in the early 1840s he was, in the words of Lord Powerscourt, 'always in debt and…used to hide in the domes of the roof of the house' to escape the Sheriff's officers who pursued him. By then he was crippled with gout and in an advanced state of alcoholism; at Powerscourt he 'used to be wheeled out on the terrace in a wheelbarrow with a bottle of sherry, and as long as that lasted he was able to design and direct the workmen, but when the sherry was finished he collapsed and was incapable of working till the drunken fit had evaporated.